Former FBI director James Comey's own memos reveal he exonerated Hillary Clinton of criminal wrongdoing BEFORE ever interviewing her and 17 other key witnesses. 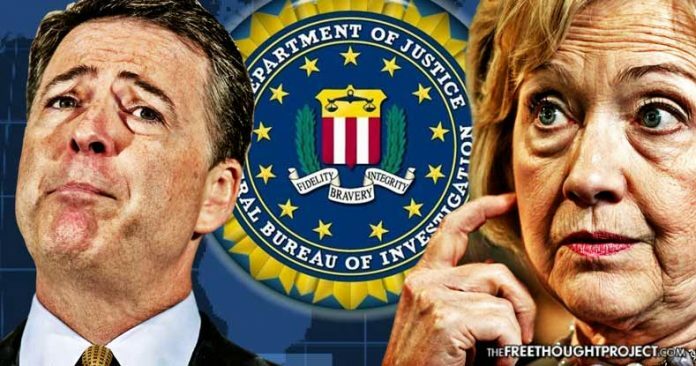 Washington, DC – In what can be described as nothing less than a bombshell revelation, memos from former FBI director James Comey, obtained by the Senate Judiciary Committee investigating his firing by President Trump, reveal that the bureau chief began writing drafts of a statement clearing Hillary Clinton of criminal wrongdoing prior to at least key 17 witnesses being interviewed by the FBI – including Clinton herself. These newly discovered facts raise the question; how can someone be exonerated of a crime before the investigation has been completed? During a press conference, on July 5, 2016, former FBI director Comey stated that he would not recommend charges to the U.S. Department of Justice, and noted that despite her mishandling of classified information on a private email server, there was no intent to subvert the law. The incriminating revelations, that Comey began drafting memos of an exoneration letter, come from transcripts of interviews given by two FBI official, according to the Daily Caller. Comey actually began penning a letter exonerating Clinton in April or May of 2016, but Clinton wasn’t even interviewed until July 2 – only three days prior to Comey’s public announcement. It seems logical that the only way Comey could have decided that Clinton was innocent prior to her and numerous witnesses being interviewed is if the facts of the case were not connected to her exoneration – or more succinctly – the investigation was simply political theater for the masses, and more importantly, rigged from the start. Two U.S. Senators, Iowa Sen. Chuck Grassley and South Carolina Sen. Lindsey Graham, sent a letter to the FBI, which specifically noted that Comey’s draft was prepared well before two Clinton aides, Cheryl Mills and Heather Samuelson, were given what Republicans deemed a “highly unusual” immunity deal with the U.S. Justice Department. The “highly unusual” limited immunity deal prohibited FBI agents and prosecutors from inquiring about conversations between Platte River Networks, the tech firm that managed Clinton’s private email server after she left the State Department, and Mills and Samuelson. The Senators strongly questioned how Comey could have conducted a complete and impartial investigation if he had already drawn a conclusion about the outcome of the case prior to all of the interviews and evidence having been collected. The facts speak for themselves, and as many people already suspected, there was no real investigation into the criminal actions of Hillary Clinton. Instead, the American public was treated to a dog and pony show meant to look as if Clinton was being held to the same standards as any other citizen. However, the same rules that would apply to any other American were summarily dismissed in an effort to bolster the presidential candidacy of an extremely powerful political operator.